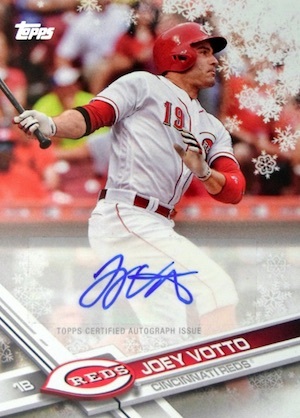 As the temperatures drop and the Christmas season takes hold, 2017 Topps Holiday Baseball again brings an exclusive snowflake design to flagship Topps. Every box contains one hit. Only available at Walmart stores, the blaster format contains 10 packs per box for $19.99. If this sounds familiar, it's because Topps first released the holiday-themed set in 2016. 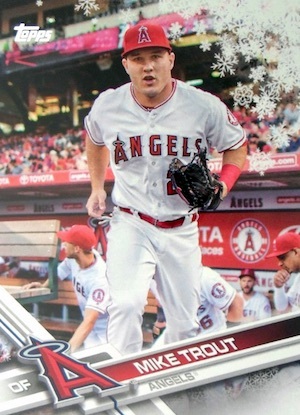 Using select options from 2017 Series 1, Series 2 and Update Series, the 2017 Topps Holiday Baseball checklist offers 200 subjects. In addition to the distinct snowflake finish, base cards feature a #HMW prefix. There are also Metallic Snowflake parallels that come in every other pack. 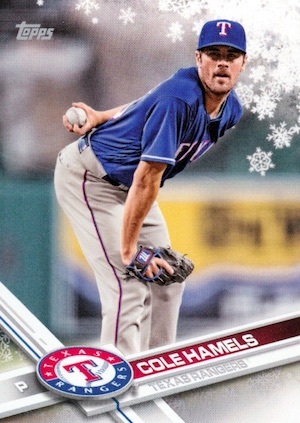 Although not intended, a production error resulted in the 2017 Topps Holiday Baseball card for Cole Hamels (#107) being found in a lower total amount in comparison to the rest of the set. According to Topps, "While the card is not scarce, collectors may notice that the Hamels card may be slightly tougher to find." Inserted one per box, the 2017 Topps Holiday Baseball hits include Relics, Autographs and Autograph Relics. There are both base versions and one-of-one Metallic Snowflake parallels for each. This retail product is not to be confused with 2017 Topps Holiday Bowman, a seasonal promo at hobby shops. PARALLEL CARDS: Metallic Snowflake (1:2 packs). PARALLEL CARDS: Metallic Snowflake 1/1 (1:20,394). PARALLEL CARDS: Metallic Snowflake 1/1 (1:18,497). PARALLEL CARDS: Metallic Snowflake 1/1 (1:12,829 packs). This is a fun set that is affordable for the young collector offering them a hit in every box. With every card virtually a parallel card of the players previously issued 2017 Topps series 1, series 2, or update card. The fact there is only 200 base cards makes set building relatively easy as well. While everyone wants to rip a 1of1 worth a mint there are still those just beginning who enjoy have one of everybody being offered and this set gives them that chance on a small budget while still getting a relic or auto of one today’s greats. It’s not for everyone but no set other than Flagship is. All cards are excellent even though some are missing the snowflakes and #107 can not be found after opening 10 boxes. Many players are not updated, trade -wise. Cannot seem to find this item in Southern Ontario, Canada, even though it is listd on Walmart’s website as a “buy in store” item. Nice product. Easy set to complete (-HMW107 Cole Hamels – Texas Rangers). Is there any confirmation this card exists? Nice set. In one box I got two cards w/o snowflakes….anyone else have this happen? I have noticed that a few cards have very little snow flake on them just under the team name (HMW30 & HMW67). Seems that the Hamels is a SSSSSSP I pulled one in 5 boxes. I know other guys who pulled zero in 15 boxes. Any official word from Topps on this? The Product on the whole is not that special. Nice to have a different picture for a few of the money cards (Judge, Bellinger) but Todd Frazier still in a WHite Sox uniform after being traded in July is lazy on Topps part. Horrible Collation per usual. 7 boxes one set. Ending up getting 5 more at another Wal Mart. Its a nice little fun set to put together. Tony C – big Rangers fan here, any chance I can pry that Hamels away from you? Or is hitting ebay? Wish they’d update traded players and use different photos. Opened 12 boxes, from 3 different locations. No #107 or even close to a set. Out of 12, got 3 Addison Russell relic cards….3, only 1 of 12 pulled auto. Maybe I just got really unlucky with this set. Seemed to open a lot of very similar packs. Judge image is from opening day set? Would have been nice to have a new one for this “exclusive set”, they managed to get a new image for Bellinger. Don’t hope to get a set opening packs, hop on eBay, let someone else do the work and get one for the price of 2 boxes. Found a Hamels in the 1 box I opened, so it does exist. Relics are awful. finally got a #107. it’s about time. bought 6 boxes. just bought 6 more opened 1 box and got the elusive #107. may take the other 5 back to walmart for a refund lol. not a bad little set.got 1 auto 6 relics. Why can’t they show the traded players like in the update series? Also, you say it is a Walmart exclusive, but my local Meijers has had this both years. Like most exclusives, many end up at other retailers despite what the card company initially indicates. Not bad, paid $20 at Wal-Mart. Got 3 errors with no snowflakes (30 Freeland, 49 Bonifacio, and 67 Winker). No Hamels, but did get a Jordan Montgomery auto. As a set builder…I have bought 59 boxes and still no Hamels. I dont think they were in the boxes shipped to Canada!! Or at least my Newfoundland. 100 cards (give or take) including one auto or relic is fairly good value considering other box sets offer less cards and no guarantee of an insert; plus they cost more. Box loses some stars because there were duplicates among the 10 packs and I’m not referring to metal variants vs. base cards so less than stellar packaging for sure. Got a Sean Newcomb autograph (and the base RC separately) in the first pack I opened; a bit of a disappointing pull. It’s not the worst box I’ve come across but overall it’s average at best in my opinion.